Elevation, altitude, altitude measurement optimization… there are loads of questions of this type at our helpdesk. Altitude measuring, displaying and optimization, however, are described in our User guide in great detail but to apply those dry technical texts when tackling common daily Locus use is not always easy. That’s why we are releasing the following article trying to answer at least the most frequent questions you send to us. People often mix these two terms so let’s make it clear – altitude concerns height of an object above the Earth surface (e.g. airplane), elevation concerns height of a place (a person, a vehicle…) on the Earth surface above the sea level. Locus can display both which is greatly favoured by many amateur pilots. How does Locus measure altitude? Primarily Locus gets the altitude values from your device (smartphone or tablet) GPS chip. It’s possible to calculate not only your horizontal position from the GPS signal but also the vertical one using larger number of satellites. Provided your device contains also barometer, Locus includes its sensor values to the altitude calculation. If you don’t have barometer or you are out of GPS signal (inside a building) Locus displays elevation values from so called HGT or SRTM files that it downloads from the Internet (when downloading LoMaps, creating routes or points). These files are freely accessible and they contain data collected by e.g. NASA. However, the are not very detailed so the values gained from them are just for basic orientation. Why are the altitude values in paper maps or on tourist signposts different from the values measured by Locus? Elevation of e.g. mountain peaks that we can see on a map or hiking signposts is acquired by professional measurement made by cartographic or geographic experts with proper equipment. Locus is provided only by values from sensors of personal devices that don’t have to be always as accurate. 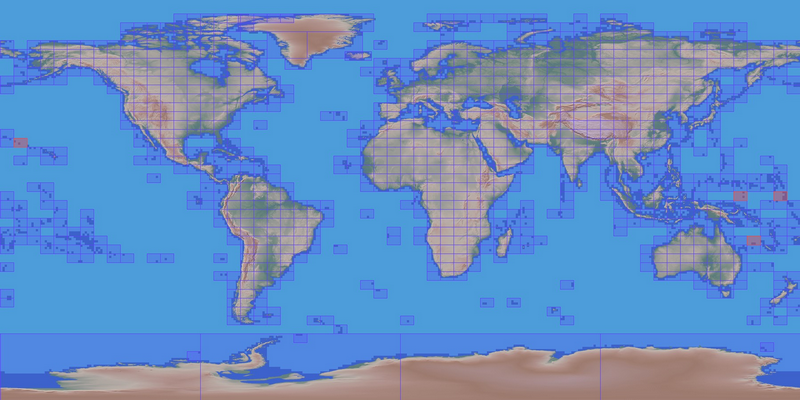 Furthermore, if we’re talking about SRTM files data. Can Locus optimize the altitude values somehow? 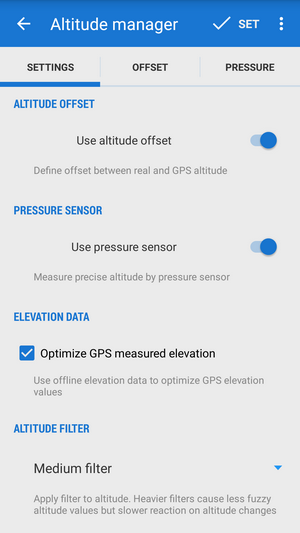 Optimization of GPS by elevation data – the values from the GPS chip show quite often quite big deviation, especially when the device lacks proper view of the sky. By checking this option you correct the deviation by downloaded SRTM data. Altitude offset – altitude calculated by the GPS chip is acquired by a method of referencing the Earth surface that is different from what is used for masp referencing. Therefore certain offset is coming out of it and it’s needs correction. The most accurate is manual correction but you can use it only in case you know the precise value of the offset at the particular spot on the Earth. 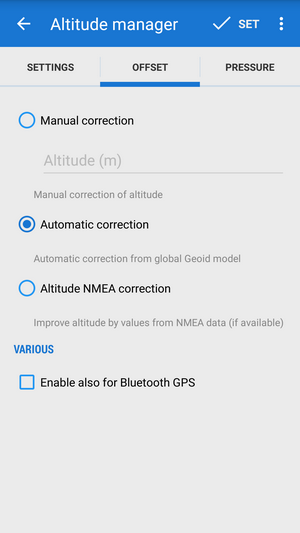 In our conditions of mobile devices the Automatic correction is very usable – it sets the offset according to the global model of geoid. Provided your device can correctly interpret NMEA messages with elevation parameters of the geoid, you can use th third method. We recommend it to the experienced users only who know what they are doing. Pressure – as we have already mentioned in the beginning many devices are equipped by the barometer. Such instrument measures pressure very precisely which can be used for calculation of relative changes of altitude. I.e. if you know the value of the atmospheric pressure at some altitude you can calculate changes in altitude between known and acual position. Firstly, such barometer must be calibrated, i.e. it must be given some default altitude or pressure value. 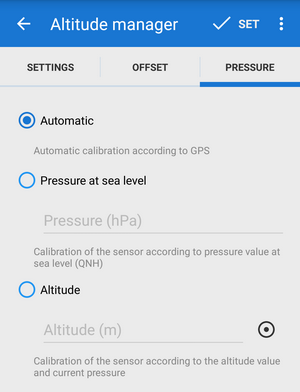 Locus offers several methods: automatic using GPS values, manual inserting of pressure value at sea level and inserting particular altitude at a particular spot. Of course this is the most accurate method but relevant only locally. Why doesn’t Locus display dynamic altitude above the cursor? I’ve imported some points from the Internet. Why doesn’t Locus display their altitude? I’ve downloaded some route to Locus from the Internet. Why doesn’t Locus render its elevation profile? I recorded track of my trip in Locus. I exported it to the web service Bikemap.net (GPSies.com, Cykloserver.cz etc. ), but it shows different elevation gain than the original track – how’s it possible? Web services usually read only trackpoint coordinates during GPX import and render them above their own 3D model of terrain. Then they calculate the resulting elevation profile from the model. However, each such model is generalized (simplified) reflection of reality and therefore the elevation gain calculated from it may differ a lot from the original. Elevation gain values displayed during the track recording often seem unrealistic. After the record is finished and the track saved all is OK, why? During the track recording Locus adds every centimeter of the elevation gain between individual trackpoints that may be placed just meters from each other and also raw altitude data from the GPS chip that may contain significant deviations. Due to saving the battery the data are optimized only after the record is finished and saved. I’m not content with the values from the built-in GPS, what should I do? Locus can communicate with external GPS devices via Bluetooth. Test it! We’re sure you’ve got tons of other topics and questions in this area. Let us know at our helpdesk, we’ll do our best to answer them all.